A labor lawyer, he beat out Boston Red Sox Chairman Tom Werner to succeed Bud Selig. BALTIMORE – Rob Manfred was elected baseball’s 10th commissioner Thursday and will succeed Bud Selig in January. A labor lawyer who has worked for Major League Baseball since 1998, Manfred beat out Boston Red Sox Chairman Tom Werner in the first contested vote for a new commissioner in 46 years. The third candidate, MLB Executive Vice President of Business Tim Brosnan, dropped out just before the start of voting. The 55-year-old Manfred, who grew up in Rome, New York – about an hour’s drive from the Hall of Fame in Cooperstown– must address issues that include decreased interest in baseball among younger people and longer games. 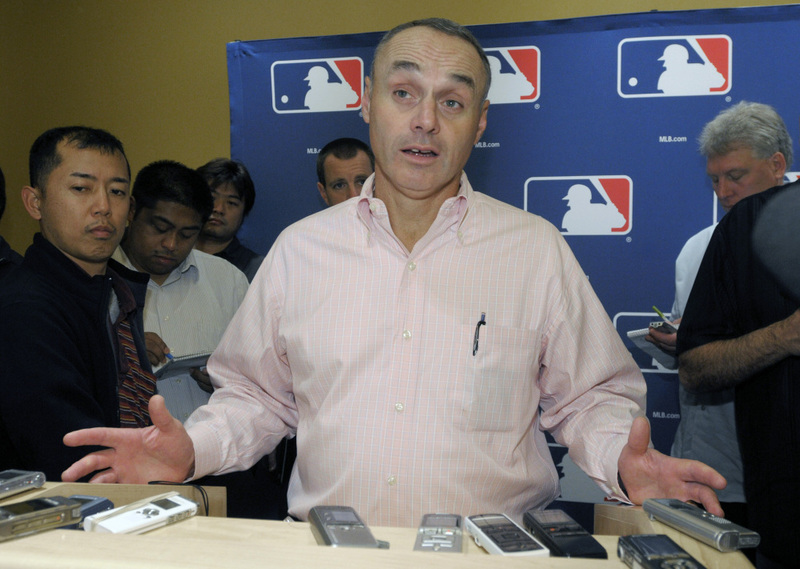 He has served as MLB’s chief operating officer for the past year. “There is no doubt in my mind he has the temperament, the training, the experience,” Selig said. Selig turned 80 last month and has ruled baseball since September 1992, when he was among the owners who forced Commissioner Fay Vincent’s resignation. He said he intends to retire in January. Manfred fell one vote shy of the 23 out of 30 owners needed in the first ballot earlier Thursday. On the second ballot, he won unanimously, several owners confirmed. Each candidate spoke to owners for about an hour Wednesday and met in sessions Thursday morning with groups of 10 teams. Werner was supported by Chicago White Sox owner Jerry Reinsdorf and Los Angeles Angels owner Arte Moreno. Other teams have said Reinsdorf wanted a commissioner who would take a harsher stance in labor negotiations. Selig is the second-longest-serving head of baseball behind Kenesaw Mountain Landis (1920-44). The trio of candidates was picked by a seven-man succession committee chaired by St. Louis Cardinals chairman Bill DeWitt Jr.
Manfred has been involved in baseball since 1987, starting as a lawyer with Morgan, Lewis & Bockius who assisted in collective bargaining. He became MLB’s executive vice president for labor relations and human resources in 1998, received an expanded role of executive vice president of economics and league affairs in 2012 and last September was promoted to chief operating officer. He helped lead negotiations for baseball’s last three labor contracts with players and the joint drug agreement that was instituted in 2002 and has been repeatedly strengthened. Werner, 64, was the controlling owner of the San Diego Padres from 1990-94, triggering fan criticism for the payroll-paring departures of Fred McGriff, Gary Sheffield, Tony Fernandez, Randy Myers and Benito Santiago. 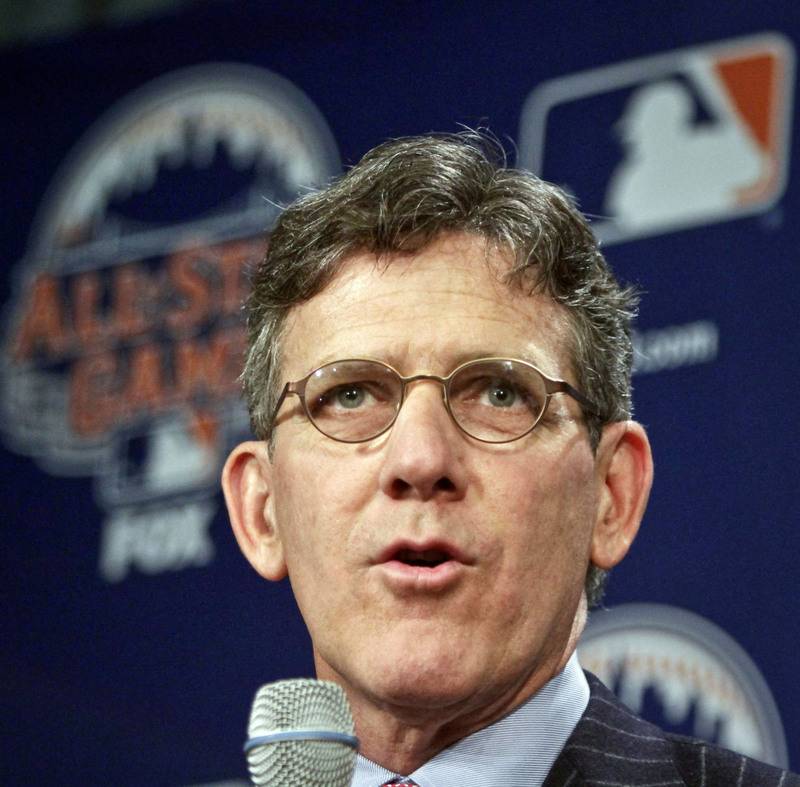 He has been part of the Red Sox ownership group since 2002, a period that included three World Series titles. While working at ABC, he helped develop Robin Williams’ “Mork & Mindy” and later was executive producer of “The Cosby Show” and “Roseanne” at The Carsey-Werner Co.
MLB’s last contested election for commissioner was after Spike Eckert was fired in December 1968. With the requirement then a three-quarters majority in both the American and National leagues, teams split between San Francisco Giants vice president Chub Feeney and Yankees president Michael Burke and failed to elect anyone during 19 ballots. Bowie Kuhn, counsel to baseball’s Player Relations Committee, was elected commissioner pro-tem on Feb. 4, 1969, with a one-year term. He was voted a seven-year term that August and remained in office until October 1984, when he was replaced by Los Angeles Olympics head Peter Ueberroth. Former Yale President A. Bartlett Giamatti took over from Ueberroth in April 1989, died later that September and was replaced by his deputy commissioner, Fay Vincent. Selig, then the Milwaukee Brewers owner, teamed with Reinsdorf to head the group that pressured for Vincent’s forced resignation in September 1992. Selig led baseball as head of the executive council for nearly six years, including the 7 1/2-month strike in 1994-95 that canceled the World Series. He repeatedly said he wouldn’t take the job fulltime before he formally was voted commissioner in July 1998.